For other uses, see Serotonin (disambiguation). Serotonin (/ˌsɛrəˈtoʊnᵻn, ˌsɪərə-/) or 5-hydroxytryptamine (5-HT) is a monoamine neurotransmitter. Biochemically derived from tryptophan, serotonin is primarily found in the gastrointestinal tract (GI tract), blood platelets, and the central nervous system (CNS) of animals, including humans. It is popularly thought to be a contributor to feelings of well-being and happiness. Approximately 90% of the human body's total serotonin is located in the enterochromaffin cells in the GI tract, where it is used to regulate intestinal movements. The serotonin is secreted luminally and basolaterally which leads to increased serotonin uptake by circulating platelets and activation after stimulation, which gives increased stimulation of myenteric neurons and gastrointestinal motility. The remainder is synthesized in serotonergic neurons of the CNS, where it has various functions. These include the regulation of mood, appetite, and sleep. Serotonin also has some cognitive functions, including memory and learning. Modulation of serotonin at synapses is thought to be a major action of several classes of pharmacological antidepressants. Serotonin secreted from the enterochromaffin cells eventually finds its way out of tissues into the blood. There, it is actively taken up by blood platelets, which store it. When the platelets bind to a clot, they release serotonin, where it serves as a vasoconstrictor and helps to regulate hemostasis and blood clotting. Serotonin also is a growth factor for some types of cells, which may give it a role in wound healing. There are various serotonin receptors. Serotonin is metabolized mainly to 5-HIAA, chiefly by the liver. Metabolism involves first oxidation by monoamine oxidase to the corresponding aldehyde. This is followed by oxidation by aldehyde dehydrogenase to 5-HIAA, the indole acetic acid derivative. The latter is then excreted by the kidneys. In addition to animals, serotonin is found in fungi and plants. Serotonin's presence in insect venoms and plant spines serves to cause pain, which is a side-effect of serotonin injection. Serotonin is produced by pathogenic amoebae, and its effect on the gut causes diarrhea. Its widespread presence in many seeds and fruits may serve to stimulate the digestive tract into expelling the seeds. Serotonin is a neurotransmitter and is found in all bilateral animals, where it mediates gut movements and the animal's perceptions of resource availability. In less complex animals, such as some invertebrates, resources simply mean food availability. In more complex animals, such as arthropods and vertebrates, resources also can mean social dominance. In response to the perceived abundance or scarcity of resources, an animal's growth, reproduction or mood may be elevated or lowered. This may somewhat depend on how much serotonin the organism has at its disposal. The 5-HT receptors, the receptors for serotonin, are located on the cell membrane of nerve cells and other cell types in animals, and mediate the effects of serotonin as the endogenous ligand and of a broad range of pharmaceutical and hallucinogenic drugs. Except for the 5-HT3 receptor, a ligand-gated ion channel, all other 5-HT receptors are G-protein-coupled receptors (also called seven-transmembrane, or heptahelical receptors) that activate an intracellular second messenger cascade. Serotonergic action is terminated primarily via uptake of 5-HT from the synapse. This is accomplished through the specific monoamine transporter for 5-HT, SERT, on the presynaptic neuron. Various agents can inhibit 5-HT reuptake, including cocaine, dextromethorphan (an antitussive), tricyclic antidepressants and selective serotonin reuptake inhibitors (SSRIs). A 2006 study conducted by the University of Washington suggested that a newly discovered monoamine transporter, known as PMAT, may account for "a significant percentage of 5-HT clearance". Contrasting with the high-affinity SERT, the PMAT has been identified as a low-affinity transporter, with an apparent Km of 114 micromoles/l for serotonin; approximately 230 times higher than that of SERT. However, the PMAT, despite its relatively low serotonergic affinity, has a considerably higher transport 'capacity' than SERT, ", resulting in roughly comparable uptake efficiencies to SERT in heterologous expression systems." The study also suggests some SSRIs, such as fluoxetine and sertraline anti-depressants, inhibit PMAT but at IC50 values which surpass the therapeutic plasma concentrations by up to four orders of magnitude. Therefore, SSRI monotherapy is "ineffective" in PMAT inhibition. At present, no known pharmaceuticals are known to appreciably inhibit PMAT at normal therapeutic doses. The PMAT also suggestively transports dopamine and norepinephrine, albeit at Km values even higher than that of 5-HT (330–15,000 μmoles/L). 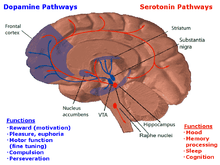 Serotonin can also signal through a nonreceptor mechanism called serotonylation, in which serotonin modifies proteins. This process underlies serotonin's effects upon platelet-forming cells (thrombocytes) in which it links to the modification of signaling enzymes called GTPases that then trigger the release of vesicle contents by exocytosis. A similar process underlies the pancreatic release of insulin. The effects of serotonin upon vascular smooth muscle tone (this is the biological function from which serotonin originally got its name) depend upon the serotonylation of proteins involved in the contractile apparatus of muscle cells. 5-HT1 receptor family signals via Gi/o inhibition of adenylyl cyclase. 5-HT1B 4.32 Vasoconstriction (agonists ↑); aggression (agonists ↓); bone mass (↓). Serotonin autoreceptor. 5-HT2 receptor family signals via Gq activation of phospholipase C.
5-HT4 125.89 Movement of food across the GI tract (agonists ↑); memory & learning (agonists ↑); antidepressant effects (agonists ↑). Signalling via Gαs activation of adenylyl cyclase. 5-HT6 98.41 Cognition (antagonists ↑); antidepressant effects (agonists & antagonists ↑). Gs signalling via activating adenylyl cyclase. 5-HT7 8.11 Cognition (antagonists ↑); antidepressant effects (antagonists ↑). Acts by Gs signalling via activating adenylyl cyclase. The neurons of the raphe nuclei are the principal source of 5-HT release in the brain. There are nine raphe nuclei, designated B1-B9, which contain the majority of serotonin-containing neurons (some scientists chose to group the nuclei raphes lineares into one nucleus), all of which are located along the midline of the brainstem, and centered on the reticular formation. Axons from the neurons of the raphe nuclei form a neurotransmitter system reaching almost every part of the central nervous system. Axons of neurons in the lower raphe nuclei terminate in the cerebellum and spinal cord, while the axons of the higher nuclei spread out in the entire brain. Serotonin is released into the space between neurons (synapse), and diffuses over a relatively wide gap (>20 µm) to activate 5-HT receptors located on the dendrites, cell bodies and presynaptic terminals of adjacent neurons. When humans smell food, dopamine is released to increase the appetite. But, unlike in worms, serotonin does not increase anticipatory behaviour in humans; instead, the serotonin released while consuming activates 5-HT2C receptors on dopamine-producing cells. This halts their dopamine release, and thereby serotonin decreases appetite. Drugs that block 5-HT2C receptors make the body unable to recognize when it is no longer hungry or otherwise in need of nutrients, and are associated with increased weight gain, especially in people with a low number of receptors. The expression of 5-HT2C receptors in the hippocampus follows a diurnal rhythm, just as the serotonin release in the ventromedial nucleus, which is characterised by a peak at morning when the motivation to eat is strongest. How much food an animal gets not only depends on food availability but also depends on the animal's ability to compete with others. This is especially true for social animals, where the stronger individuals might steal food from the weaker (this is not to say some non-social animals do not concern themselves with the needs of others or steal food from others). Thus, serotonin is not only involved in the perception of food availability but also involved in social rank. In macaques, alpha males have twice the level of serotonin released in the brain than subordinate males and females (as measured by the levels of 5-Hydroxyindoleacetic acid (5-HIAA) in the cerebro-spinal fluid). Dominance status and cerebro-serotonin levels appear to be positively correlated. When dominant males were removed from such groups, subordinate males begin competing for dominance. Once new dominance hierarchies were established, serotonin levels of the new dominant individuals also increased to double those in subordinate males and females. The reason why serotonin levels are only high in dominant males but not dominant females has not yet been established. In humans, levels of 5-HT1A receptor activation in the brain show negative correlation with aggression, and a mutation in the gene that codes for the 5-HT2A receptor may double the risk of suicide for those with that genotype. Serotonin in the brain is not usually degraded after use, but is collected by serotonergic neurons by serotonin transporters on their cell surfaces. Studies have revealed nearly 10% of total variance in anxiety-related personality depends on variations in the description of where, when and how many serotonin transporters the neurons should deploy. The gut is surrounded by enterochromaffin cells, which release serotonin in response to food in the lumen. This makes the gut contract around the food. Platelets in the veins draining the gut collect excess serotonin. If irritants are present in the food, the enterochromaffin cells release more serotonin to make the gut move faster, i.e., to cause diarrhea, so the gut is emptied of the noxious substance. If serotonin is released in the blood faster than the platelets can absorb it, the level of free serotonin in the blood is increased. This activates 5HT3 receptors in the chemoreceptor trigger zone that stimulate vomiting. The enterochromaffin cells not only react to bad food but are also very sensitive to irradiation and cancer chemotherapy. Drugs that block 5HT3 are very effective in controlling the nausea and vomiting produced by cancer treatment, and are considered the gold standard for this purpose. In mice and humans, alterations in serotonin levels and signalling have been shown to regulate bone mass. Mice that lack brain serotonin have osteopenia, while mice that lack gut serotonin have high bone density. In humans, increased blood serotonin levels have been shown to be significant negative predictor of low bone density. Serotonin can also be synthesized, albeit at very low levels, in the bone cells. It mediates its actions on bone cells using three different receptors. Through 5-HT1B receptors, it negatively regulates bone mass, while it does so positively through 5-HT2B receptors and 5-HT2C receptors. There is very delicate balance between physiological role of gut serotonin and its pathology. Increase in the extracellular content of serotonin results in a complex relay of signals in the osteoblasts culminating in FoxO1/ Creb and ATF4 dependent transcriptional events. These studies have opened a new area of research in bone metabolism that can be potentially harnessed to treat bone mass disorders. Since serotonin signals resource availability it is not surprising that it affects organ development. Many human and animal studies have shown that nutrition in early life can influence, in adulthood, such things as body fatness, blood lipids, blood pressure, atherosclerosis, behavior, learning and longevity. Rodent experiment shows that neonatal exposure to SSRI's makes persistent changes in the serotonergic transmission of the brain resulting in behavioral changes, which are reversed by treatment with antidepressants. By treating normal and knockout mice lacking the serotonin transporter with fluoxetine scientists showed that normal emotional reactions in adulthood, like a short latency to escape foot shocks and inclination to explore new environments were dependent on active serotonin transporters during the neonatal period. Human serotonin can also act as a growth factor directly. Liver damage increases cellular expression of 5-HT2A and 5-HT2B receptors, mediating liver compensatory regrowth (see Liver § Regeneration and transplantation) Serotonin present in the blood then stimulates cellular growth to repair liver damage. 5HT2B receptors also activate osteocytes, which build up bone However, serotonin also inhibits osteoblasts, through 5-HT1B receptors. Serotonin, in addition, evokes endothelial nitric oxide synthase activation and stimulates, through a 5-HT1B receptor-mediated mechanism, the phosphorylation of p44/p42 mitogen-activated protein kinase activation in bovine aortic endothelial cell cultures. In blood, serotonin is collected from plasma by platelets, which store it. It is thus active wherever platelets bind in damaged tissue, as a vasoconstrictor to stop bleeding, and also as a fibrocyte mitotic (growth factor), to aid healing. Several classes of drugs target the 5-HT system, including some antidepressants, antipsychotics, anxiolytics, antiemetics, and antimigraine drugs, as well as the psychedelic drugs and empathogens. The psychedelic drugs psilocin/psilocybin, DMT, mescaline, and LSD are agonists, primarily at 5HT2A/2C receptors. The empathogen-entactogen MDMA releases serotonin from synaptic vesicles of neurons. Drugs that alter serotonin levels are used in treating depression, generalized anxiety disorder and social phobia. Monoamine oxidase inhibitors (MAOIs) prevent the breakdown of monoamine neurotransmitters (including serotonin), and therefore increase concentrations of the neurotransmitter in the brain. MAOI therapy is associated with many adverse drug reactions, and patients are at risk of hypertensive emergency triggered by foods with high tyramine content, and certain drugs. Some drugs inhibit the re-uptake of serotonin, making it stay in the synaptic cleft longer. The tricyclic antidepressants (TCAs) inhibit the reuptake of both serotonin and norepinephrine. The newer selective serotonin reuptake inhibitors (SSRIs) have fewer side-effects and fewer interactions with other drugs. Certain SSRI medications have been shown to lower serotonin levels below the baseline after chronic use, despite initial increases. The 5-HTTLPR gene codes for the number of serotonin transporters in the brain, with more serotonin transporters causing decreased duration and magnitude of serotonergic signaling. The 5-HTTLPR polymorphism (l/l) causing more serotonin transporters to be formed is also found to be more resilient against depression and anxiety. Extremely high levels of serotonin can cause a condition known as serotonin syndrome, with toxic and potentially fatal effects. In practice, such toxic levels are essentially impossible to reach through an overdose of a single antidepressant drug, but require a combination of serotonergic agents, such as an SSRI with an MAOI. The intensity of the symptoms of serotonin syndrome vary over a wide spectrum, and the milder forms are seen even at nontoxic levels. Some 5-HT3 antagonists, such as ondansetron, granisetron, and tropisetron, are important antiemetic agents. They are particularly important in treating the nausea and vomiting that occur during anticancer chemotherapy using cytotoxic drugs. Another application is in the treatment of postoperative nausea and vomiting. Some serotonergic agonist drugs cause fibrosis anywhere in the body, particularly the syndrome of retroperitoneal fibrosis, as well as cardiac valve fibrosis. In the past, three groups of serotonergic drugs have been epidemiologically linked with these syndromes. These are the serotonergic vasoconstrictive antimigraine drugs (ergotamine and methysergide), the serotonergic appetite suppressant drugs (fenfluramine, chlorphentermine, and aminorex), and certain anti-Parkinsonian dopaminergic agonists, which also stimulate serotonergic 5-HT2B receptors. These include pergolide and cabergoline, but not the more dopamine-specific lisuride. As with fenfluramine, some of these drugs have been withdrawn from the market after groups taking them showed a statistical increase of one or more of the side effects described. An example is pergolide. The drug was declining in use since it was reported in 2003 to be associated with cardiac fibrosis. Two independent studies published in the New England Journal of Medicine in January 2007, implicated pergolide, along with cabergoline, in causing valvular heart disease. As a result of this, the FDA removed pergolide from the U.S. market in March 2007. (Since cabergoline is not approved in the U.S. for Parkinson's Disease, but for hyperprolactinemia, the drug remains on the market. Treatment for hyperprolactinemia requires lower doses than that for Parkinson's Disease, diminishing the risk of valvular heart disease). 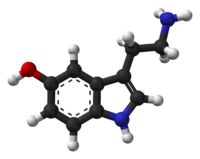 For details on tryptamine neurotransmitters in humans, see Trace amine. Several plants contain serotonin together with a family of related tryptamines that are methylated at the amino (NH2) and (OH) groups, are N-oxides, or miss the OH group. These compounds do reach the brain, although some portion of them are metabolized by monoamine oxidase enzymes (mainly MAO-A) in the liver. Examples are plants from the Anadenanthera genus that are used in the hallucinogenic yopo snuff. These compounds are widely present in the leaves of many plants, and may serve as deterrents for animal ingestion. Serotonin occurs in several mushrooms of the genus Panaeolus. Serotonin in mammals is made by two different tryptophan hydroxylases: TPH1 produces serotonin in the pineal gland and the enterochromaffin cells, while TPH2 produces it in the Raphe nuclei and in the myenteric plexus. Genetically altered mice lacking TPH1 develop progressive loss of heart strength early on. They have pale skin and breathing difficulties, are easily tired, and eventually die of heart failure. Genetically altered mice that lack TPH2 are normal when they are born. However, after three days, they appear to be smaller and weaker, and have softer skin than their siblings. In a purebred strain, 50% of the mutants died during the first four weeks, but in a mixed strain, 90% survived. Normally, the mother weans the litter after three weeks, but the mutant animals needed five weeks. After that, they caught up in growth and had normal mortality rates. Subtle changes in the autonomic nervous system are present, but the most obvious difference from normal mice is the increased aggressiveness and impairment in maternal care of young. Despite the blood-brain barrier, the loss of serotonin production in the brain is partially compensated by intestinal serotonin. The behavioural changes become greatly enhanced if one crosses TPH1- with TPH2-lacking mice and gets animals that lack TPH entirely. In humans, defective signaling of serotonin in the brain may be the root cause of sudden infant death syndrome (SIDS). Scientists from the European Molecular Biology Laboratory in Monterotondo, Italy genetically modified lab mice to produce low levels of the neurotransmitter serotonin. The results showed the mice suffered drops in heart rate and other symptoms of SIDS, and many of the animals died at an early age. Researchers now believe low levels of serotonin in the animals' brainstems, which controls heartbeat and breathing, may have caused sudden death. If neurons that make serotonin — serotonergic neurons — are abnormal in human infants, there is a risk of sudden infant death syndrome (SIDS). Recent research conducted at Rockefeller University shows, in both patients who suffer from depression as well as mice that model the disorder, levels of the p11 protein are decreased. This protein is related to serotonin transmission within the brain. Serotonin is used by a variety of single-cell organisms for various purposes. SSRIs have been found to be toxic to algae. The gastrointestinal parasite Entamoeba histolytica secretes serotonin, causing a sustained secretory diarrhea in some patients. Patients infected with E. histolytica have been found to have highly elevated serum serotonin levels, which returned to normal following resolution of the infection. E. histolytica also responds to the presence of serotonin by becoming more virulent. This means serotonin secretion not only serves to increase the spread of enteamoebas by giving the host diarrhea but also serves to coordinate their behaviour according to their population density, a phenomenon known as quorum sensing. Outside the gut of a host, there is nothing that the entoamoebas provoke to release serotonin, hence the serotonin concentration is very low. Low serotonin signals to the entoamoebas they are outside a host and they become less virulent to conserve energy. When they enter a new host, they multiply in the gut, and become more virulent as the enterochromaffine cells get provoked by them and the serotonin concentration increases. In drying seeds, serotonin production is a way to get rid of the buildup of poisonous ammonia. The ammonia is collected and placed in the indole part of L-tryptophan, which is then decarboxylated by tryptophan decarboxylase to give tryptamine, which is then hydroxylated by a cytochrome P450 monooxygenase, yielding serotonin. However, since serotonin is a major gastrointestinal tract modulator, it may be produced by plants in fruits as a way of speeding the passage of seeds through the digestive tract, in the same way as many well-known seed and fruit associated laxatives. Serotonin is found in mushrooms, fruits and vegetables. The highest values of 25–400 mg/kg have been found in nuts of the walnut (Juglans) and hickory (Carya) genera. Serotonin concentrations of 3–30 mg/kg have been found in plantains, pineapples, banana, kiwifruit, plums, and tomatoes. Moderate levels from 0.1–3 mg/kg have been found in a wide range of tested vegetables. Serotonin is one compound of the poison contained in stinging nettles (Urtica dioica), where it causes pain on injection in the same manner as its presence in insect venoms (see below). It is also naturally found in Paramuricea clavata, or the Red Sea Fan. Serotonin and tryptophan have been found in chocolate with varying cocoa contents. The highest serotonin content (2.93 µg/g) was found in chocolate with 85% cocoa, and the highest tryptophan content (13.27–13.34 µg/g) was found in 70–85% cocoa. The intermediate in the synthesis from tryptophan to serotonin, 5-hydroxytryptophan, was not found. Serotonin functions as a neurotransmitter in the nervous systems of most animals. For example, in the roundworm Caenorhabditis elegans, which feeds on bacteria, serotonin is released as a signal in response to positive events, e.g., finding a new source of food or in male animals finding a female with which to mate. When a well-fed worm feels bacteria on its cuticle, dopamine is released, which slows it down; if it is starved, serotonin also is released, which slows the animal down further. This mechanism increases the amount of time animals spend in the presence of food. The released serotonin activates the muscles used for feeding, while octopamine suppresses them. Serotonin diffuses to serotonin-sensitive neurons, which control the animal's perception of nutrient availability. If lobsters are injected with serotonin, they behave like dominant individuals whereas octopamine causes subordinate behavior. A crayfish that is frightened may flip its tail to flee, and the effect of serotonin on this behavior depends largely on the animal's social status. Serotonin inhibits the fleeing reaction in subordinates, but enhances it in socially dominant or isolated individuals. The reason for this is social experience alters the proportion between serotonin receptors (5-HT receptors) that have opposing effects on the fight-or-flight response. The effect of 5-HT1 receptors predominates in subordinate animals, while 5-HT2 receptors predominates in dominants. Serotonin is evolutionary conserved and appears across the animal kingdom. It is seen in insect processes in roles similar to in the human central nervous system, such as memory, appetite, sleep, and behavior. Locust swarming is mediated by serotonin, by transforming social preference from aversion to a gregarious state that enables coherent groups. Learning in flies and honeybees is affected by the presence of serotonin. Insect 5-HT receptors have similar sequences to the vertebrate versions, but pharmacological differences have been seen. Invertebrate drug response has been far less characterized than mammalian pharmacology and the potential for species selective insecticides has been discussed. Wasps and hornets have serotonin in their venom, as do scorpions. If flies are fed serotonin, they are more aggressive; flies depleted of serotonin still exhibit aggression, but they do so much less frequently. In the nematode C. elegans, artificial depletion of serotonin or the increase of octopamine cues behavior typical of a low-food environment: C. elegans becomes more active, and mating and egg-laying are suppressed, while the opposite occurs if serotonin is increased or octopamine is decreased in this animal. Serotonin is necessary for normal nematode male mating behavior, and the inclination to leave food to search for a mate. The serotonergic signaling used to adapt the worm's behaviour to fast changes in the environment affects insulin-like signaling and the TGF beta signaling pathway, which control long-term adaption. In the fruit fly insulin both regulates blood sugar as well as acting as a growth factor. Thus, in the fruit fly, serotonergic neurons regulate the adult body size by affecting insulin secretion. Serotonin has also been identified as the trigger for swarm behavior in locusts. In humans, though insulin regulates blood sugar and IGF regulates growth, serotonin controls the release of both hormones, modulating insulin release from the beta cells in the pancreas through serotonylation of GTPase signaling proteins. Exposure to SSRIs during Pregnancy reduces fetal growth. Serotonin is known to regulate aging, learning and memory. The first evidence comes from the study of longevity in C. elegans. During early phase of aging, the level of serotonin increases, which alters locomotory behaviors and associative memory. The effect is restored by mutations and drugs (including mianserin and methiothepin) that inhibit serotonin receptors. The observation does not contradict with the notion that the serotonin level goes down in mammals and humans, which is typically seen in late but not early phase of aging. Genetically altered C. elegans worms that lack serotonin have an increased reproductive lifespan, may become obese, and sometimes present with arrested development at a dormant larval state. The pathway for the synthesis of serotonin from tryptophan. In animals including humans, serotonin is synthesized from the amino acid L-tryptophan by a short metabolic pathway consisting of three enzymes: tryptophan hydroxylase (TPH), aromatic amino acid decarboxylase (DDC) and pyridoxal phosphate. The TPH-mediated reaction is the rate-limiting step in the pathway. TPH has been shown to exist in two forms: TPH1, found in several tissues, and TPH2, which is a neuron-specific isoform. Serotonin can be synthesized from tryptophan in the lab using Aspergillus niger and Psilocybe coprophila as catalysts. The first phase to 5-hydroxytryptophan would require letting tryptophan sit in ethanol and water for 7 days, then mixing in enough HCl (or other acid) to bring the pH to 3, and then adding NaOH to make a pH of 13 for 1 hour. Asperigillus niger would be the catalyst for this first phase. The second phase to synthesizing tryptophan itself from the 5-hydroxytryptophan intermediate would require adding ethanol and water, and letting sit for 30 days this time. The next two steps would be the same as the first phase: adding HCl to make the pH = 3, and then adding NaOH to make the pH very basic at 13 for 1 hour. This phase uses the Psilocybe coprophila as the catalyst for the reaction. Serotonin taken orally does not pass into the serotonergic pathways of the central nervous system, because it does not cross the blood–brain barrier. However, tryptophan and its metabolite 5-hydroxytryptophan (5-HTP), from which serotonin is synthesized, does cross the blood–brain barrier. These agents are available as dietary supplements, and may be effective serotonergic agents. One product of serotonin breakdown is 5-hydroxyindoleacetic acid (5-HIAA), which is excreted in the urine. Serotonin and 5-HIAA are sometimes produced in excess amounts by certain tumors or cancers, and levels of these substances may be measured in the urine to test for these tumors. Consuming purified tryptophan increases brain serotonin whereas eating foods containing tryptophan does not. This is because the transport system which brings tryptophan across the blood-brain barrier is also selective for the other amino acids contained in protein sources. High plasma levels of other large neutral amino acids compete for transport and prevent the elevated plasma tryptophan from increasing serotonin synthesis. In 1935, Italian Vittorio Erspamer showed an extract from enterochromaffin cells made intestines contract. Some believed it contained adrenaline, but two years later, Erspamer was able to show it was a previously unknown amine, which he named "enteramine". In 1948, Maurice M. Rapport, Arda Green, and Irvine Page of the Cleveland Clinic discovered a vasoconstrictor substance in blood serum, and since it was a serum agent affecting vascular tone, they named it serotonin. In 1952, enteramine was shown to be the same substance as serotonin, and as the broad range of physiological roles was elucidated, the abbreviation 5-HT of the proper chemical name 5-hydroxytryptamine became the preferred name in the pharmacological field. Synonyms of serotonin include: 5-hydroxytriptamine, thrombotin, enteramin, substance DS, and 3-(β-Aminoethyl)-5-hydroxyindole. In 1953, Betty Twarog and Page discovered serotonin in the central nervous system. ↑ Pietra, S.;Farmaco, Edizione Scientifica 1958, Vol. 13, pp. 75–9. ↑ Mazák, K.; Dóczy, V.; Kökösi, J.; Noszál, B. (2009). "Proton Speciation and Microspeciation of Serotonin and 5-Hydroxytryptophan". Chemistry & Biodiversity. 6 (4): 578–90. doi:10.1002/cbdv.200800087. PMID 19353542. ↑ Erspamer, Vittorio (1952). "Ricerche preliminari sulle indolalchilamine e sulle fenilalchilamine degli estratti di pelle di Anfibio". Ricerca Scientifica. 22: 694–702. ↑ Tammisto, Tapani (1967). 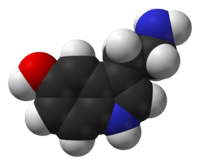 "Increased toxicity of 5-hydroxytryptamine by ethanol in rats and mice". Annales medicinae experimentalis et biologiae Fenniae. 46 (3, Pt. 2): 382–4. ↑ "Serotonin". Dictionary.com Unabridged. Random House. ↑ González-Flores D, Velardo B, Garrido M, González-Gómez D, Lozano M, Ayuso M.C, Barriga C, Paredes S.D, Rodríguez A.B. (2011). "Ingestion of Japanese plums (Prunus salicina Lindl. cv. Crimson Globe) increases the urinary 6-sulfatoxymelatonin and total antioxidant capacity levels in young, middle-aged and elderly humans: Nutritional and functional characterization of their content". Journal of Food and Nutrition Research 50(4): 229-236. ↑ Young SN (2007). "How to increase serotonin in the human brain without drugs". Rev. Psychiatr. Neurosci. 32 (6): 394–99. PMC 2077351 . PMID 18043762. ↑ King MW. "Serotonin". The Medical Biochemistry Page. Indiana University School of Medicine. Retrieved 1 December 2009. ↑ Coila, Bridgett. "Effects of Serotonin on the Body." LiveStrong. n.p., 20 June. 2010. Web. 11 Aug. 2013. ↑ Hannon J, Hoyer D; Hoyer (2008). "Molecular biology of 5-HT receptors". Behav. Brain Res. 195 (1): 198–213. doi:10.1016/j.bbr.2008.03.020. PMID 18571247. ↑ Roth, BL; Driscol, J (12 January 2011). "PDSP Ki Database". Psychoactive Drug Screening Program (PDSP). University of North Carolina at Chapel Hill and the United States National Institute of Mental Health. Retrieved 17 December 2013. ↑ Moro, Christian; Edwards, Lily; Chess-Williams, Russ (2016). "5-HT2A receptor enhancement of contractile activity of the porcine urothelium and lamina propria". International Journal of Urology. doi:10.1111/iju.13172. ISSN 0919-8172. PMID 27531585. ↑ Gonzalez, R; Chávez-Pascacio, K; Meneses, A (September 2013). "Role of 5-HT5A receptors in the consolidation of memory". Behavioural Brain Research. 252: 246–251. doi:10.1016/j.bbr.2013.05.051. PMID 23735322. ↑ Frazer, A. & Hensler, J. G. (1999). "Understanding the neuroanatomical organization of serotonergic cells in the brain provides insight into the functions of this neurotransmitter". In Siegel, G. J. Basic Neurochemistry. Agranoff, Bernard W.; Fisher, Stephen K.; Albers, R. Wayne; Uhler, Michael D. (Sixth ed.). Lippincott Williams and Wilkins. ISBN 0-397-51820-X. In 1964, Dahlstrom and Fuxe (discussed in ), using the Falck-Hillarp technique of histofluorescence, observed that the majority of serotonergic soma are found in cell body groups, which previously had been designated as the Raphe nuclei. ↑ Binder, Marc D.; Hirokawa, Nobutaka (2009). encyclopedia of neuroscience. Berlin: Springer. p. 705. ISBN 978-3-540-23735-8. ↑ Leibowitz SF (1990). "The role of serotonin in eating disorders". Drugs. 39 Suppl 3: 33–48. doi:10.2165/00003495-199000393-00005. PMID 2197074. ↑ Basky, Greg (2000). "Suicide linked to serotonin gene". CMAJ. 162 (9): 1343. ↑ Rang, H. P. (2003). Pharmacology. Edinburgh: Churchill Livingstone. p. 187. ISBN 0-443-07145-4. ↑ Rosen CJ (2009). "Breaking into bone biology: serotonin's secrets". Nat Med. 15 (2): 145–6. doi:10.1038/nm0209-145. PMID 19197289. ↑ Maciag D; Simpson KL; Coppinger D; et al. (January 2006). "Neonatal Antidepressant Exposure has Lasting Effects on Behavior and Serotonin Circuitry". Neuropsychopharmacology. 31 (1): 47–57. doi:10.1038/sj.npp.1300823. PMC 3118509 . PMID 16012532. ↑ Holden C (October 2004). "Neuroscience. Prozac treatment of newborn mice raises anxiety". Science. 306 (5697): 792. doi:10.1126/science.306.5697.792. PMID 15514122. ↑ Marieb, Elaine Nicpon (2009). Essentials of human anatomy & physiology (Eighth ed.). San Francisco: Pearson/Benjamin Cummings. p. 336. ISBN 0-321-51342-8. ↑ Nichols DE (2000). "Role of serotonergic neurons and 5-HT receptors in the action of hallucinogens". In Baumgarten HG; Gothert M. Serotoninergic Neurons and 5-HT Receptors in the CNS. Santa Clara, CA: Springer-Verlag TELOS. ISBN 3-540-66715-6. ↑ Kapur S, Seeman P; Seeman (2002). "NMDA receptor antagonists ketamine and PCP have direct effects on the dopamine D(2) and serotonin 5-HT(2)receptors-implications for models of schizophrenia". Mol. Psychiatry. 7 (8): 837–44. doi:10.1038/sj.mp.4001093. PMID 12232776. ↑ Goodman, Louis S. (Louis Sanford); Brunton, Laurence L.; Chabner, Bruce. ; Knollmann, Björn C. (2001). Goodman and Gilman's pharmacological basis of therapeutics. New York: McGraw-Hill. pp. 459–461. ISBN 0-07-162442-2. ↑ Pezawas, Lukas; Meyer-Lindenberg, Andreas; Drabant, Emily M; Verchinski, Beth A; Munoz, Karen E; Kolachana, Bhaskar S; Egan, Michael F; Mattay, Venkata S; Hariri, Ahmad R; Weinberger, Daniel R (2005). "5-HTTLPR polymorphism impacts human cingulate-amygdala interactions: A genetic susceptibility mechanism for depression". Nature Neuroscience. 8 (6): 828–34. doi:10.1038/nn1463. PMID 15880108. ↑ Schinka, J A; Busch, R M; Robichaux-Keene, N (2004). "A meta-analysis of the association between the serotonin transporter gene polymorphism (5-HTTLPR) and trait anxiety". Molecular Psychiatry. 9 (2): 197–202. doi:10.1038/sj.mp.4001405. PMID 14966478. ↑ Isbister, G. K.; Bowe, S. J.; Dawson, A.; Whyte, I. M. (2004). "Relative toxicity of selective serotonin reuptake inhibitors (SSRIs) in overdose". J. Toxicol. Clin. Toxicol. 42 (3): 277–85. doi:10.1081/CLT-120037428. PMID 15362595. 1 2 Baskin SI (1991). Principles of cardiac toxicology. Boca Raton: CRC Press. ISBN 0-8493-8809-0. Retrieved 3 February 2010. ↑ Jähnichen S; Horowski R; Pertz H. "Pergolide and Cabergoline But not Lisuride Exhibit Agonist Efficacy at Serotonin 5-HT2B Receptors" (PDF). Retrieved 3 February 2010. ↑ Adverse Drug Reactions Advisory Committee, Australia (2004). "Cardiac valvulopathy with pergolide". Aust Adv Drug React Bull. 23 (4). Archived from the original on 27 June 2012. ↑ "Food and Drug Administration Public Health Advisory". 29 March 2007. Retrieved 7 February 2010. ↑ "MedWatch – 2007 Safety Information Alerts. Permax (pergolide) and generic equivalents". U.S. Food and Drug Administration. 29 March 2007. Retrieved 30 March 2007. ↑ Tyler VE (September 1958). "Occurrence of serotonin in a hallucinogenic mushroom". Science. 128 (3326): 718. Bibcode:1958Sci...128..718T. doi:10.1126/science.128.3326.718. PMID 13580242. 1 2 Côté F, Thévenot E, Fligny C, et al. (2003). "Disruption of the nonneuronal tph1 gene demonstrates the importance of peripheral serotonin in cardiac function". Proc. Natl. Acad. Sci. U.S.A. 100 (23): 13525–30. Bibcode:2003PNAS..10013525C. doi:10.1073/pnas.2233056100. PMC 263847 . PMID 14597720. ↑ Savelieva KV, Zhao S, Pogorelov VM, et al. (2008). Bartolomucci A, ed. "Genetic disruption of both tryptophan hydroxylase genes dramatically reduces serotonin and affects behavior in models sensitive to antidepressants". PLoS ONE. 3 (10): e3301. Bibcode:2008PLoSO...3.3301S. doi:10.1371/journal.pone.0003301. PMC 2565062 . PMID 18923670. ↑ Audero, Enrica; Coppi, Elisabetta; Mlinar, Boris; Rossetti, Tiziana; Caprioli, Antonio; Al Banchaabouchi, Mumna; Corradetti, Renato; Gross, Cornelius (2008). "Sporadic Autonomic Dysregulation and Death Associated with Excessive Serotonin Autoinhibition". Science. 321 (5885): 130–133. Bibcode:2008Sci...321..130A. doi:10.1126/science.1157871. PMID 18599790. ↑ Feldman JM, Lee EM; Lee (October 1985). "Serotonin content of foods: effect on urinary excretion of 5-hydroxyindoleacetic acid". The American Journal of Clinical Nutrition. 42 (4): 639–43. PMID 2413754. ↑ Jonz, Michael G.Riga, EkateriniMercier, A. JoffrePotter, John W. "Effects Of 5-HT (Serotonin) On Reproductive Behaviour In Heterodera Schachtii (Nematoda)." Canadian Journal Of Zoology 79.9 (2001): 1727. Canadian Reference Centre. Web. 11 August 2013. ↑ Niacaris T, Avery L; Avery (2003). "Serotonin regulates repolarization of the C. elegans pharyngeal muscle". J. Exp. Biol. 206 (Pt 2): 223–31. doi:10.1242/jeb.00101. PMID 12477893. ↑ Kravitz, E.A. (1988). "Hormonal control of behavior: amines and the biasing of behavioral output in lobsters". Science. 241 (4874): 1775–81. Bibcode:1988Sci...241.1775K. doi:10.1126/science.2902685. PMID 2902685. ↑ "Serotonin, serotonin receptors and their actions in insects". Neurotransmitter Vol 2, 1. 2015. doi:10.14800/nt.314. ↑ Anstey ML; Rogers SM; Ott SR; Burrows M; Simpson SJ (30 January 2009). "Serotonin Mediates Behavioral Gregarization Underlying Swarm Formation in Desert Locusts". Science. 323: 627–30. doi:10.1126/science.1165939. PMID 19179529. ↑ "Serotonin is critical for rewarded olfactory short-term memory in Drosophila.". J Neurogenet. 26: 238–244. 2012. doi:10.3109/01677063.2012.666298. ↑ "Chemical codes for the control of behaviour in arthropods.". Nature. 337: 33–39. 1989. doi:10.1038/337033a0. ↑ "Design and synthesis of novel insecticides based on the serotonergic ligand 1-[(4-aminophenyl)ethyl]-4-[3- (trifluoromethyl)phenyl]piperazine (PAPP).". J Agric Food Chem. 58: 2624–2629. 2010. doi:10.1021/jf902640u. ↑ Loer CM, Kenyon CJ; Kenyon (1993). "Serotonin-deficient mutants and male mating behavior in the nematode Caenorhabditis elegans". J. Neurosci. 13 (12): 5407–17. PMID 8254383. ↑ Murakami, H; Murakami, S (2007). "Serotonin receptors antagonistically modulate Caenorhabditis elegans longevity". Aging Cell. 6 (4): 483–8. doi:10.1111/j.1474-9726.2007.00303.x. PMID 17559503. ↑ Ruaud AF, Thummel CS; Thummel (2008). "Serotonin and insulin signaling team up to control growth in Drosophila". Genes Dev. 22 (14): 1851–5. doi:10.1101/gad.1700708. PMC 2735276 . PMID 18628391. ↑ Murakami H, Murakami S; Murakami (August 2007). "Serotonin receptors antagonistically modulate Caenorhabditis elegans longevity". Aging Cell. 6 (4): 483–8. doi:10.1111/j.1474-9726.2007.00303.x. PMID 17559503. ↑ Alarcon, J (2008). "Biotransformation of indole derivatives by mycelial cultures". Zeitschrift für Naturforschung C. 63: 82. doi:10.1515/znc-2008-1-215. 1 2 Young SN (2007). "How to increase serotonin in the human brain without drugs". J Psychiatry Neurosci. 32 (6): 394–9. PMC 2077351 . PMID 18043762. ↑ Wurtman, RJ; Hefti, F; Melamed, E (1980). "Precursor control of neurotransmitter synthesis". Pharmacol Rev. 32: 315–35. PMID 6115400. ↑ Negri L (2006). "[Vittorio Erspamer (1909–1999)]". Med Secoli (in Italian). 18 (1): 97–113. PMID 17526278. ↑ FELDBERG W, TOH CC; Toh (February 1953). "Distribution of 5-hydroxytryptamine (serotonin, enteramine) in the wall of the digestive tract". The Journal of Physiology. 119 (2–3): 352–62. doi:10.1113/jphysiol.1953.sp004850. PMC 1392800 . PMID 13035756. ↑ SciFinder – Serotonin Substance Detail. Accessed (4 November 2012). ↑ Twarog BM, Page IH; Page (October 1953). "Serotonin content of some mammalian tissues and urine and a method for its determination". The American Journal of Physiology. 175 (1): 157–61. PMID 13114371. Wikimedia Commons has media related to Serotonin. PsychoTropicalResearch Extensive reviews on serotonergic drugs and Serotonin Syndrome. Serotonin Test Interpretation on ClinLab Navigator. Gutknecht L; Jacob C; Strobel A; et al. (June 2007). "Tryptophan hydroxylase-2 gene variation influences personality traits and disorders related to emotional dysregulation". The International Journal of Neuropsychopharmacology. 10 (3): 309–20. doi:10.1017/S1461145706007437. PMID 17176492. ‡References for synthetic TAAR1 agonists can be found at TAAR1 or in the associated compound articles. For TAAR2 and TAAR5 agonists and antagonists, see TAAR for references.